We take a look at some of the Avengers: Age of Ultron content updates happening now in games on mobile and Facebook. While Avengers: Age of Ultron may not hit theaters until May 1, there are already plenty of ways for Marvel fans to experience themed content surrounding the film within mobile and Facebook games. On top of the Age of Ultron update released in Kabam’s Marvel Contest of Champions last week, gamers can also play through new content in mobile games including Marvel Puzzle Quest, Zen Pinball and Marvel Pinball, as well as Marvel: Avengers Alliance on Facebook. 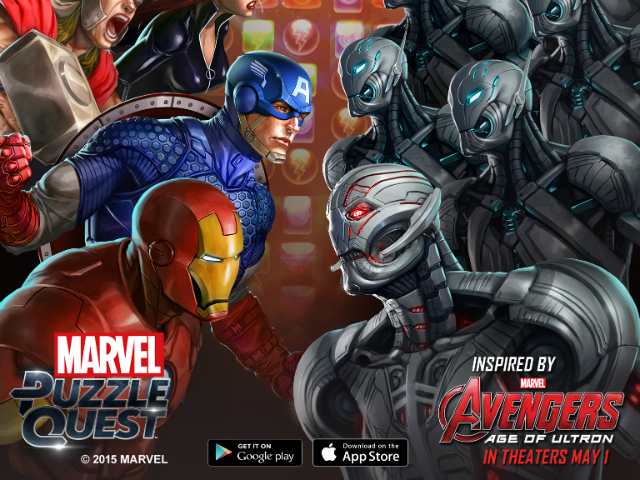 First, D3Publisher‘s Marvel Puzzle Quest has been updated with the Avengers vs. Ultron event, which is the first Boss Battle event in the game. This extremely limited time event sees players working to earn Iron Man: Hulkbuster as an in-game prize. As a special Boss Battle event, players will work to climb alliance specific leaderboards. That is, each alliance has its own score target to reach, representing Ultron’s health. Players must work together to earn this number of points and defeat Ultron before the event ends. Marvel Puzzle Quest is available to download for free on the iTunes App Store, Google Play and Steam for PC. Next, Zen Studios has released an Avengers: Age of Ultron pinball table as an in-app purchase in Zen Pinball and Marvel Pinball on mobile devices. The table features dedicated game modes for each member of the Avengers team, including a first-person sharpshooting game for Hawkeye and an aerial melee combat sequence for Iron Man and Ultron. Before playing, gamers can choose the difficulty setting that’s right for them. Zen Pinball and Marvel Pinball are available to download for free or $0.99 on mobile devices, respectively. Finally, in Disney Interactive’s Marvel: Avengers Alliance on Facebook, players can complete a new Spec Op inspired by the film. The chapter features a new storyline, which begins as a series of “seemingly random attacks” prove to be a “systematic exploration of S.H.I.E.L.D.’s responses.” Ultron quickly makes an appearance, threatening the planet, and players must work to stop him before it’s too late. This update features a new battle between Hulkbuster and Hulk, alongside Empowered Iso-8 for Iron Man and Hulk. Players can unlock new uniforms for Captain America and Black Widow, with new uniforms for Thor, Hawkeye, Vision, Quicksilver and Scarlet Witch coming later on. Finally, once players have completed a special task, they’ll be able to purchase new pants for Hulk. Instead of the game’s traditional hero reward, players who complete this event will receive the new Iron Man Avengers: Age of Ultron uniform. It’s the first to include two new suits of armor in one, and gives players the ability to switch their uniform during combat. Marvel: Avengers Alliance is available to play for free on Facebook.